Safety razors have somehow come back into vogue. While you may not have seen this vintage shaving tool since you were visiting grandpa’s house, you’ll be glad to hear that the best razor blades with safety features are back in style. Safety razor blades are, on the whole, more durable, effective, and economical than any kind of disposable or cartridge razors. They’ll get you a better shave time after time for far less than you’re paying now for Gillette cartridges. Safety razors are also more environmentally friendly. According to the Environmental Protection Agency, more than 2 million disposable razors find their way into landfills every year–and all of that plastic adds up. With metal blades and handles, these razor blades are good for your face and good for the planet. However, your safety razor is really only as good as these best razor blades. While the razor itself may have a glossy handle and feel perfectly balanced in your hand, the blades will determine the quality of the shave. Thankfully, you can use a variety of different blades in the same razor. You can try out different blades until you feel like you’ve found one that’s right for you. Remember, not all razor blades are made equally, and not every blade can tackle every kind of beard. Personally, I love to use Astra blades because I have very coarse facial hair and sensitive skin, but you may prefer something sharper and more aggressive. In this guide to the best safety razor blades, we’ll review the top four razor blades on the market and discuss the criteria by which we usually judge them. Originally based in the Czech Republic, Astra was later bought out by Gillette and is now produced by ZAO Petersburg Products in Russia. 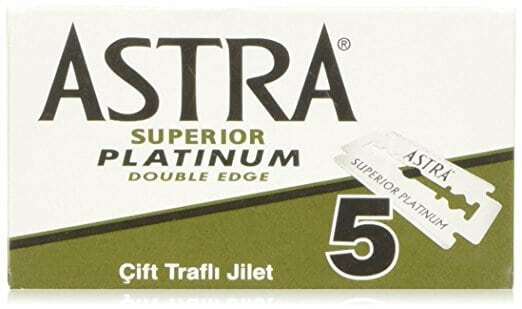 The Astra Superior Platinum Double Edge blades are the perfect combination safety razor blades as I like to say. That is to say that they are sharp enough to tear through coarse facial hair, but they won’t ever leave your face raw and red. 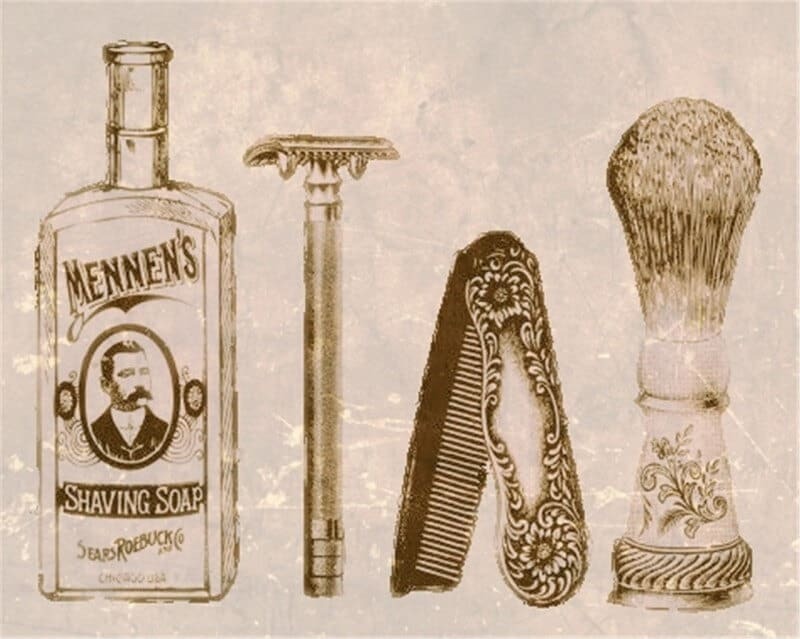 You can get a quality shave relatively quickly without having to pay too much attention. They’re not the sharpest blades on the market for sure as you will find out in this guide to the best safety razor blades, but you’ll still get a close shave on the first pass. If you have coarse facial hair, you’ll be able to get three to four shaves out of each blade, and if you have thin to normal hair, you’ll be able to go four to six shaves before switching to a new blade. That being said, they’re significantly cheaper than Feather blades, for instance. You’ll pay less than half the price for Astra than you will for Feather. Finally in this guide to the best razor blades, Astra blades come in convenient packages of five blades with dispensers on the bottom for easy access. They do not, however, come with packages that allow you to dispose of them safely. If you’re concerned about throwing your blades in the trash, you’ll have to purchase a disposal case from Amazon.com separately. Astras would go perfectly in the Edwin Jagger on Amazon.com razor or the Merkur 34C on Amazon.com. A slant-head razor would probably be a bit to aggressive considering that Astras are already sharp, but it suits most other kinds of razors quite nicely. 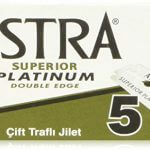 Overall, Astra blades are one of the best balanced razors. They’re extremely sharp yet still comfortably smooth. Whenever I shave with Astra blades, I walk away with a baby-smooth face, and they never irritate my face–not even a bit. Astras aren’t as sharp as Feather blades are, but they’ll last twice or even three times as long. If you’re looking for a reliable, all-around blade, Astra razor blades are your best bet. Personna Double Edge Razors are ideal for men with thinner facial hair but who don’t necessarily have sensitive skin. They’re considerably duller than Feather blades as you will find out in this guide to the best safety razor blades, but as a result, they tend to last a few shaves longer. 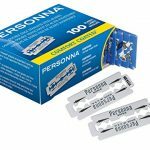 While you can usually get about only two to three decent shaves out of Feathers, Personna razor blades can last at least four to five shaves if not a whole week. That being said, they probably won’t last you quite as long as Astra blades will, but they’re not as aggressive as Astra blades either. So, chances are you’ll nick yourself a lot less often even after the fourth or fifth pass. These blades are cheap enough though, that you can treat them as disposable blades and throw them out after just a single use. Even if you shave every single day, a single box will last you three whole months–six months if you shave every other day. Personna blades are reasonably aggressive, they smoothly glide across your skin without ever pulling or tugging on your hair. They might irritate your skin if you have particularly sensitive skin or if you shave too often, but they also get the job done without dulling too quickly. So, it’s a trade-off. When you open the box, be aware that the logos are sloppily printed on the razors. Some customers were dismayed and assumed they had received a cheap replica manufactured in China. This is not the case–these blades are, in fact, manufactured right here in the United States of America! 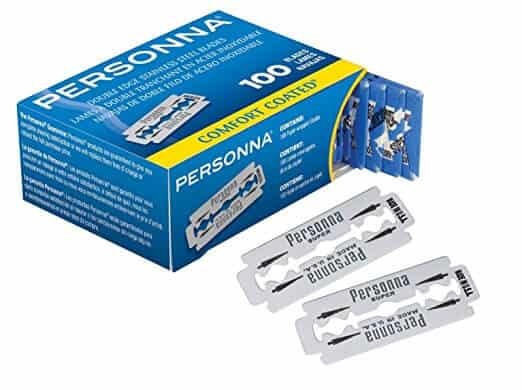 You can support an American company by purchasing Personna Double Edge Razor Blades. Enjoy a close shave and show your patriotic spirit all at the same time! 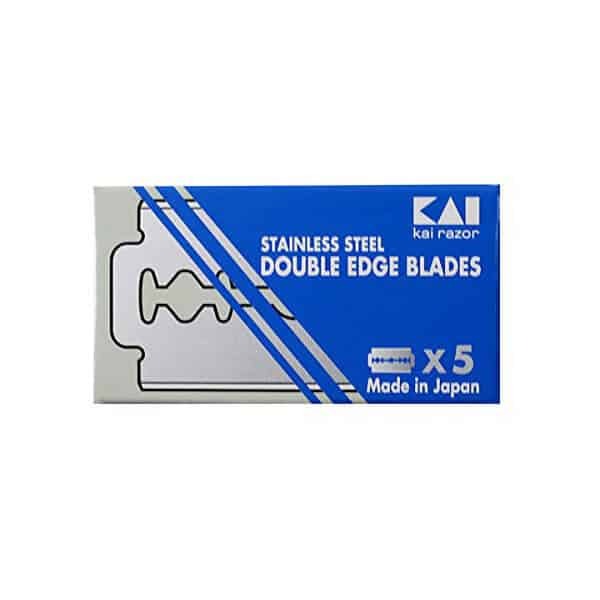 Feather Double Double Edge Safety Razor Blades are, without a doubt, the sharpest blades available on the market. These Japanese-made razor blades will slice through even the toughest facial with a single pass without ever tugging or pulling. You will find out in this guide to safety razor blades that they are coated in stainless platinum, you’ll be able to get a perfect close shave every single time. In fact, Feather produces their hi-stainless blades through the same process they produce surgical blades. Known for their precision and accuracy, Feather razor blades will give you the closest shave you’ve ever had. On the other hand, these blades cost twice as much as Personna or Astra blades, and they don’t last nearly as long. On an Astra blade, you might be able to go an entire week or even two on a single blade, but you’ll immediately notice the difference between your first and second shave with a Feather. By the third shave, it will already start to feel dull. Really, you should only be able to get one to two shaves out of a Feather blade. Now, at about 25 cents a blade, you’re still going to make out far better than you would using $3-4 cartridge razor head. So, in the long-run, an extra 10 cents really won’t make that much of a difference. You should know though that you are paying twice the amount for a super-smooth shave. Ironically enough, you also need to be sure to be very careful with a Feather. The blade is very sharp, and it can easily cut you if you’re not paying attention. That doesn’t mean that those who are new to wet-shaving can’t use them, but they should exercise caution especially when shaving sensitive areas like the upper lip. I try my best to use Feathers only in my more gentle razors like my Viking Chieftan from Amazon.com because the razor doesn’t need to be all that aggressive if the blade is already so sharp. If you want a close shave though, there is no other blade on the market for you. Feather is the #1 sharpest safety razor blade available, as we confirm in this guide to the best razor blades that are safe to use. 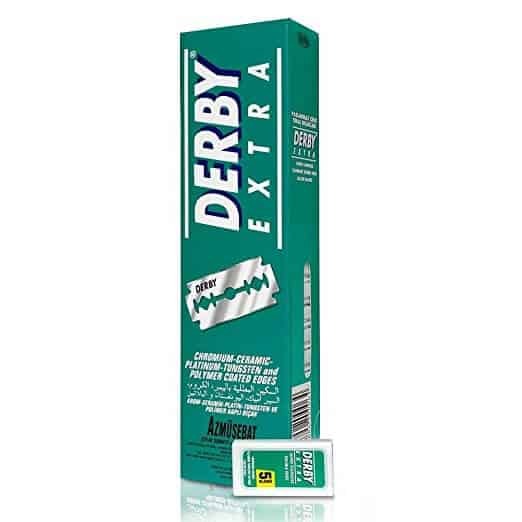 Derby Double Edge Razor Blades are some of the smoothest blades available. 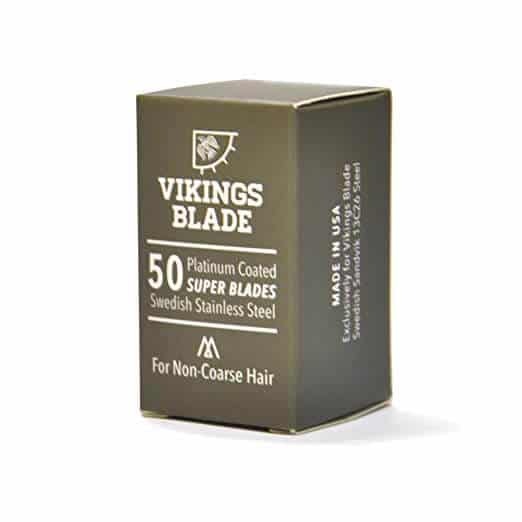 They are made from stainless steel from Sweden that is ground and hardened with a polymer of tungsten, platinum, and chromium ceramic for longevity and shaving comfort. Indeed, the blade glides effortlessly across the jaw-line and never causes irritation or discomfort. You’ll likely have to make multiple passes with derby safety razor blades to get a really close shave, but because they’re so smooth, the extra shaving won’t cause you any pain. In fact, in many years of shaving with Derby razors, I don’t think I’ve cut myself even one time. Derby razors are perfect for any men who are just starting with wet-shaving and need time to practice their technique before they begin using Feather or Astra blades, for example. You can just begin with sharp blades right away if you really take your time, but if you’re nervous, these smoother blades are a great place to start. 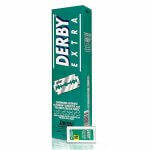 Alternatively, you could pick up Derby blades for days when you’re in a rush and need a quick shave. If you’re pressed for time, chances are you’re not going to want to use a sharp razor. By contrast, you can quickly run a Derby blade over your face without paying too much attention. They’re also great for weekends and lazy days off when you may not feel the need to get a super close shave. I like to pair my Derby with a more aggressive razor like the Parker 99R from Amazon.com because the weight and effectiveness of the razor provides a nice balance. The smooth blade will protect my skin, and the razor will provide the force needed to cut through coarse hair. Best of all, these razor blades only cost $9 for a pack of 100 blades. That’s a mere 9 cents a blade–a price you can’t find anywhere else. Then when you’re done with the blade, you can slide it into the convenient disposal slot located right on the package itself. Coming in at $0.44 per blade, they are not the cheapest by far. What you get for that price is an exceptionally sharp razor with little flex. They are ideal for guys with thick beards. 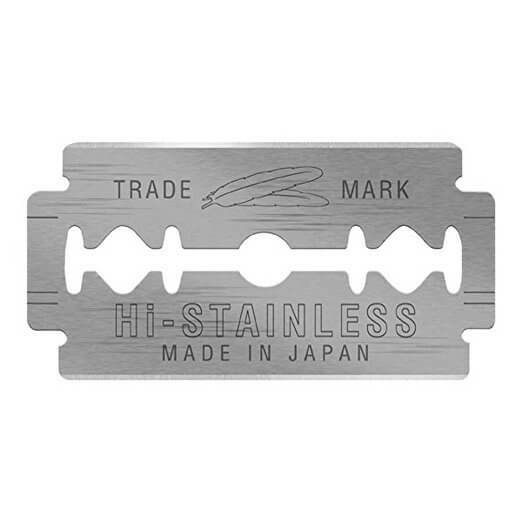 Not only are the blades made of Japanese surgical grade stainless steel, but they jut out further than most blades from the edge of the DE safety razor. This gives a smoother shave then the blades that are little more flush to the edge. These are not platinum coated, but still, glide across the skin. For those that look for non-platinum coated look no further. These don’t need the edge hardened to last longer by using a platinum coating. How many shaves you get will depend on how you shave and how thick your beard is. Moderately thick beards can expect 4 to 5 shaves from a Kai razor before needing to replace. The high price then is somewhat reduced to a lower cost per shave than some of the cheaper razor blades. Cheaper blades can’t do as many shaves since they get dull quickly when up against a thick, wiry beard. So, the cost comes out a push or maybe slightly higher for Kai than others. Kai vs Feather, which one is better? Lets find out more in this guide to safety razor blades. This is a very common question when mentioning Kai blades. They are very similar, but I feel like Kai are better than Feather on tough beards. Feather are very sharp, but they have some flex to them which can end up tugging on thick beards. Kai are a bit more rigid so they are able to slice right through even very coarse wiry beards much better. One is not better than the other in general, it just depends on what you need to the blade to do. Guys with sensitive skin need a DE blade that is not too aggressive. If your skin is sensitive, and your beard is not too thick, then try these mild razor blades by Viking Chieftain. They are the same company that makes awesome safety razors, so they now are also in the blade making game. Featuring stainless steel from Sweden, the blades are manufactured in the USA. These are especially great when needing to shave every day. Since they are mild and not aggressive, they won’t do a number on your face when using every day. The price is right at $0.30 per blade and 50 blades could last you up to a year if your beard is fine. These are platinum coated for a smooth shave and a hardened edge for a top-notch shave. If you suffer from razor burn or your skin tends to get blotchy after shaving with a straight razor, then you owe it to yourself to try a blade that should make shaving with a safety razor more enjoyable. One word of caution, though we give in this guide to the best razor blades that are safe to use. If you have sensitive skin with a thick beard, then these are not the best razor blades for you. These are made to be mild so to get a close shave with a thick beard you will have to go over the beard a few times, which in turn will likely irritate your skin. Better to go with a more aggressive blade if you have coarse beard hair. On a smooth safety razor blade, the cutting angle is less severe. In this case, you’ll have to put more effort behind each stroke to achieve the same effect, but the blade won’t nick you as often. That being said, if you’re passing over the same area of skin multiple times, it can easily become raw. A sharp safety razor blade will slash through coarse hair in fewer strokes, but you have to be careful with it. Remember, sharp blades aren’t necessarily better because you’ll be sacrificing comfort whenever you opt for sharper edges. We determine how aggressive a blade is based on the blade gap and the blade exposure. The more the blade is exposed and the further apart it’s set from the clipper, the more efficiently it slices through hair and the more likely you are to nick yourself. When choosing your safety razor blade, don’t assume that the sharpest blade is the most effective. You’ll also want to consider how thick your hair is, how much you’re willing to spend, how the blade of the handle fits in your hand, and how easy it is to change blades. Safety razors are typically made with higher quality steel than the metal in cartridge razors. That being said, all razors can irritate your skin if you don’t prep properly. Make sure you’re applying the right shaving cream before you start and a good aftershave balm to refresh your skin when you’re done if you want to make the most of your razor blades. In this guide, you have found out that they come in all different shapes and sizes, and the one for your beard may not work for your brother’s beard or your co-worker’s beard. Once you have your safety razor, you’ll want to try a few different blades to see which ones work for you and which ones are compatible with your razor. Which are your best safety razor blades among the ones discussed above? We here at the Hair Clippers Club would love to hear your thoughts!